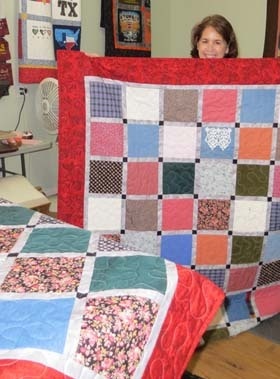 We are happy to help with your quilt, so we have put together several articles that will help you plan your memory quilt. Here are at least 10 items of clothing that you might consider using in your memory quilt. Your loved one has passed. How do you sort the clothes and decide what to do with the clothing. What would you like on the back side of your memory quilt? How much does it cost? what goes into the pricing of a memory quilt. Order form to get your order started. Gallery of photos with the different syles of quilts used with clothing other than t-shirts.